Where They Raced LAP2 is the follow-up version to Where They Raced, Harold Osmer's original graduate thesis. 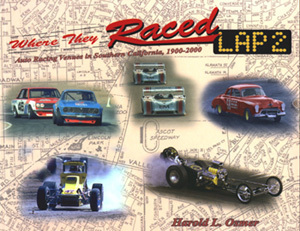 Now expanded to 144 pages, LAP2 illustrates how auto racing venue locations mimicked the growth of Los Angeles from 1900-2000. More auto racing has taken place in Southern California than any other place in the world. The index lists 174 different official racing venues. Period aerial photographs graphically show many before/after race locations. From the real roads at Pasadena, Santa Monica, and Corona to the board tracks at Marina del Rey, Beverly Hills, and Culver City, to the myriad small ovals, Where They Raced LAP2 breaks it all down for you. Yes, a dvd version of Where They Raced LAP2 is now available. Director Harry Pallenberg (formerly of Huell Howser Productions) teamed with us to create a fun, informative documentary bringing the old venue photos to life. Unfortunately, while the DVD is pretty good, the director has proven to be both fraud and thief. Thus I no longer recommend either the DVD or its director. That's Gilmore Stadium above, circa 1946, and the CBS television studios below, 1969. 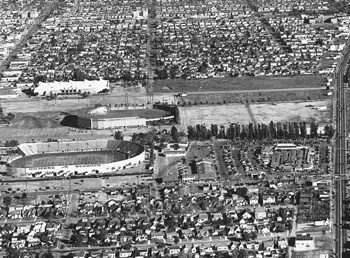 Gilmore Stadium was built in 1935 with the idea of racing midgets, but many other events were held there, including Los Angeles' first professional football game. Comparing these two photos, the view is eastward. 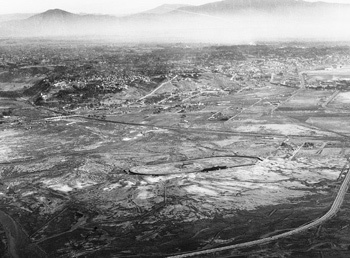 You can see the white Pan-Pacific Auditorium in the background, Gilmore Field (in the top image), and just make out a curved line on the pavement to the right of the CBS eye marking the previous edge of Gilmore Stadium. The year is 1902, Pasadena. It's Waldemar Grant Hansen at the wheel. A machinist by trade, Hansen developed metal machining techniques and provided engine parts for the Tourist Automobile Company, a Los Angeles automaker at the time. 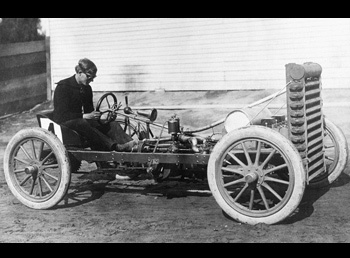 He regularly tested his machines on the apricot orchard roads in and around Pasadena and Altadena, eventually leading to the Pasadena/Altadena Hill Climb events of 1906-1909. 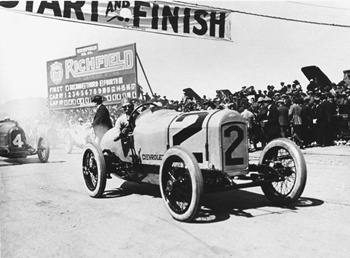 The Santa Monica Road Races were held 1909-1919. Put on by the city, auto dealers, and real estate developers, they were used as a promotion to bring people to Santa Monica from across the country. The course (which can be run today) ran from Ocean & Montana to Wilshire Boulevard, uphill to San Vicente and back to Ocean. Barney Oldfield, Ralph DePalma, Eddie Pullen, and Terrible Teddy Tetzlaff competed in what were the biggest race meets in the country at that time. Here's a good trivia question for you to lay on your buddies: Who was the first woman licensed by NASCAR to race against the men on the West Coast? That's her in the jalopy, Hila Paulson (Hila Sweet today). It was December 1956 at Gardena Stadium and she proved a very worthy adversary. Car builder Ummie Paulson had hotshoe Rufus "Parnelli" Jones driving his racer before he moved on up. Hila created the Lady Leadfoots racing squad and tore up the tracks of Southern California for many years. The Ganzer, Palmquist, Weeks dry lakes roadster represents innovation at it's best. 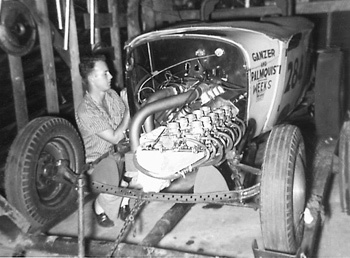 There are ten carburetors attached to the front-mount blower. Ganzer says that at idle it sounded like a Model-T and wide open it sounded "...like ten thousand of them." Ah yes, Silvergate Speedway in San Diego. 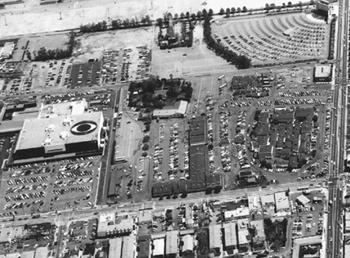 The site is now home to Sea World. But from 1933 to '36, Silvergate hosted big car races on a 5/8-mile oiled dirt surface. 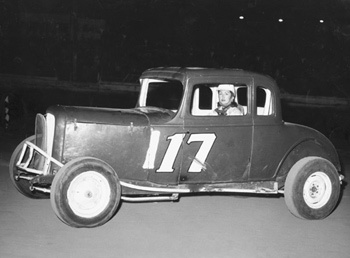 Rex Mays won the opening event on May 7, 1933. Where They Raced LAP2 includes ovals, drags, the big tracks at Ontario, Riverside, and Fontana. From Bakersfield to Los Angeles, and San Diego, LAP2 has it.